Molosser dog native of the islands of Tenerife and Gran Canaria, in the Canary Archipelago. Emerging as a result of crosses between the “majorero”, a pre-Hispanic cattle dog originating from the islands, and molosser dogs brought to the archipelago. 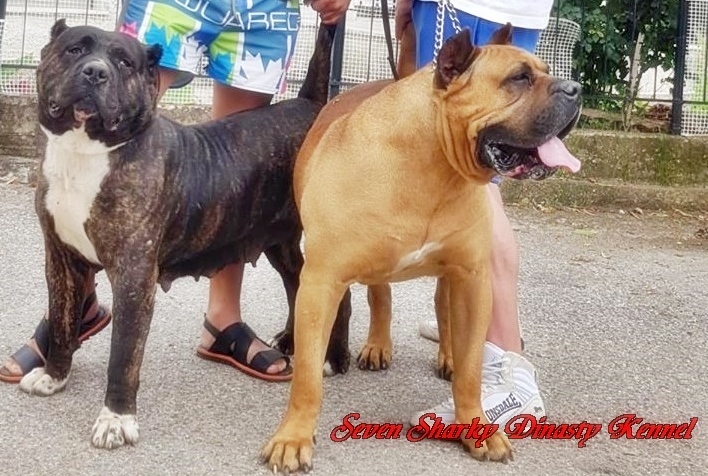 These crosses originated an ethnic grouping of dogs of “dogo” type, of medium size, of brindle or fawn color, marked with white, of robust morphology, characteristic of a molosser, but with agility and drive Of tremendous temperament, rustic and of an active and loyal character. During the XVI and XVII centuries their population increased considerably. Numerous mentions of them exist in the historical texts prior to the conquest, mainly in the “Documents of the Town Council” which explained the functions that they fulfilled. Essentially they functioned as a guardian and cattle dog, as well subdued the cattle for the butchers. Molosser dog of medium size, well balanced, of straight profile, with a black mask. Rustic and well proportioned. It is mesomorphic; the body is longer than the height to the withers. Females accentuate this characteristic being slightly longer. Their appearance is calm. Attentive gaze. Especially equipped for the function of guarding and traditionally used for the handling and driving of cattle. Their temperament is balanced and of great self-security. Serious and profound bark. He is gentle and noble with his family, with great affection to his owner, and suspicious with strangers. Expression is confident, noble and a little distant. When alert his attitude is very firm and the gaze watchful. Is massive, brachycephalic, of solid appearance, and covered with loose hanging skin. Its shape is a somewhat lengthened cube. The proportions of cranium-muzzle are 60%- 40%. The width of the cranium is 3/5 of the total longitude of the head. Lightly convex in anteroposterior and transversal directions, although the frontal bone is flatten to the plane. Zygomatic arch very pronounced, with well developed temporal and mastoid muscles, but without being pronounced. The occipital crest is unappreciable. Defined, but not abrupt. The middle furrow between the frontal sinuses is marked and occupies approximately two thirds of the cranium. The craniofacial lines are parallel or lightly convergent. Shorter than the cranium. Normally 40% of the total head. The width is 2/3 of the cranium. It is of very wide base and diminishes slightly toward the nose. The nasal line is flat, of straight profile and without ridges. Wide, strongly pigmented in black. It is inserted on the same line as the nasal cana. The front is set slightly behind the front of the lips. The nostrils are large, appropriate for easy breathing. The upper lips hang, but without excess and when viewed from the front form an inverted “V” where they join. The interior lips are dark. Scissor bite. Level bite is accepted although not desirable due to the tooth ware that it causes. Slight prognathism permitted. The canines show wide transverse distance. The teeth are wide, with a strong base of implantation, with large molars, small incisors and well-developed and correct fitting canines. Slightly oval, medium to large size, well separated, brevilineal, neither sunken nor bulging. They are well pigmented in black and tight, never drooping. The color fluctuates between medium to dark chestnut, in accordance with the color of the coat. Never light. Of medium size, well separated, with short and fine hair, they drop effortlessly to both sides of the head. If they are folded, they are rose shaped, close fitting to the head. The base is at a point slighter higher than the eye line. Ears set very high and joined are atypical and excessively crowd the top of the cranium. If cropped they are erect. Somewhat shorter than the total length of the head. The lower portion presents loose skin that contributes to the formation of a slight dewlap. It is solid, straight, cylindrical and very muscular. Straight lined, wide, deep, the length is 18-20% longer than the height at the withers, this being more accentuated in females. The flanks are not very marked. Straight, without deformities, supported by well developed, but not very visible musculature. It ascends slightly from withers to the croup. Never saddled nor roached. Medium, wide and rounded. It should not be long, because it would limit movement. Females normally wider. With great width, pectoral muscles very marked. The depth should arrive to a minimum at the elbow, from the profile and from front. The thoracic perimeter will be normally equal to the height at the withers plus 45%s. Ribs very arched. Thick base, narrowing until the tip and not surpassing the hock. Insertion medium. In action it rises in shape of a saber, without coiling or pointing toward the back. It in rest hangs straight with a slight curve in the tip. – Shoulders: With good inclination. – Elbows: They should not be affixed to the chest or pointing outward. The distance of the elbow to the ground normally represents 50% of the total height in the males and somewhat less in the females. – Metacarpals: Very solid and slightly inclined. – Front Feet: Cat foot with rounded toes, not very close together. The pads are well developed and black. The nails are dark, white is undesirable, although they can appear according to the coat. Strong and parallel, without deviations. – Thigh: Long and very muscular. The angulation is not pronounced, but without being scarce. -Rear Feet: Slightly longer than the front and of the same characteristics. The movement should be agile, elastic and cover a lot of ground. Long steps. The carriage of the tail is low and barely rises above the dorsal line. At attention, the position of the head and the tail is raised. Thick and elastic. Loose in and around the neck. When alert it forms several symmetrical wrinkles in the middle furrow between the front sinuses like axis in the head. Short, rustic, very flat, without undercoat (at times might be found, in neck and buttocks) and with a certain harshness to the touch. Is very short and fine in the ears, slightly longer in the withers and crest of the buttocks. Brindle all ranges, from dark very warm tones to the very light gray or blond. Fawn to sandy in all ranges. Markings can appear on the chest, at the base of the neck or throat, on front and rear toes, it is desirable that it is reduced as much as possible. Mask always black and should not surpasses the height of the eyes. In the case of very typical specimens, a 1cm deviation from the set maximum and minimum will be allowed. Any deviation of the afore mentioned is considered a fault and the seriousness of it is considered to the degree of deviation from the standard. – Excessive wrinkles in the craniofacial region, which does not spoil the expression. – Head that doesn’t complete the established proportion. – Mask that surpasses the eyes. – Front and rear feet turned inward or outward. – Very scarce or excessive angulations. – Chest not very deep. – Head triangular, narrow, not cubed. – Tail coiled, very fine, of the same thickness the entire length or deformed. – Very short or excessive size. – Saddled or roached top line. – Scarce posterior chest. Weak front. Ribs not well arched. – Absence of wrinkles in the facial cranium region (tight skin without elasticity). – Eyes light (yellow). Eyes very close together or oblique. Protruding or sunken. – Absence of any tooth (except the P.1). – Ears set very high. – Cranium round or arched. – Hair satiny and fine. – Neck long, not massive. – Character unbalanced and any indication of aggressiveness. – Total depigmentation of the nose or inside of the lips. – Total absence of mask. – Croup lower than the withers, descending dorsal line. – Blue eyes or with different colors. – Under developed chest, (Cathedral chest).